When Nick and I traveled to Thailand in April for our honeymoon, we stayed in several different places. On our trip, we had time in both Koh Samui on Chaweng Beach, and in Bangkok. In Koh Samui, we spent the first 9 days at First Bungalow Beach Resort, and the next nine days at Chaweng Regent Beach Resort. Today, I'm going to give a quick review of Chaweng Regent Beach Resort! Upon arriving at Chaweng Regent, we were quickly greeted and seated with a welcome cocktail and cool towels. Because of the high heat in Thailand, the towels were an excellent touch to wipe your face and hands with, cooling yourself down. The check-in process took a little bit longer than we would have liked- we waited for 15 or so minutes before being allowed to fully check in. After this, it was off to check out our rooms and the rest of the hotel! Our room was a very good size, and the bed was super comfortable. As an added touch for our honeymoon, the maid staff had left two hearts made of flowers for us on our bed. The room was plenty big for the two of us, and featured a large bed, walking space, a television, a full-sized sofa, and as an added bonus a private outdoor patio. The closet space was ample as well. The bathroom at the Chaweng Regent Beach Resort was incredibly nice. It featured a shower (with both hot and cold water), as well as a massive jacuzzi tub. One of the best features of the bathroom that that it was a screened-in 'open air' concept, where you felt like you were outside almost. We enjoyed that this hotel provided various toiletries, such as shampoo, conditioner, and body lotion. Over all, our hotel room was quite nice and felt luxurious. The air conditioning worked incredibly well, with the only downside being that as the bathroom was open-air the bathroom would get quite warm. The pool area at Chaweng Regent was nice, and a quick walk from our room. Because we stayed in the 'hotel' portion of Chaweng Regent, we had the short walk: otherwise, if you upgrade to a bungalow you will almost have your room open right up to the pool. The pool area was adjacent to the beach. At all times, the pool area was quite busy (with screaming children always) and you had to arrive early enough in the morning to ensure you were able to get a chair. On the beach, there were several rows of chairs and then just a short amount of beach before the water. Overall; our stay at Chaweng Regent was very smooth and went perfectly. Chaweng Regent is right in the middle of the strip of Chaweng Beach, so a perfect location for those looking to be in the action. However, after our stay in a poolside bungalow at First Bungalow Beach Resort, we felt that the difference in cost of the two resorts was not worth it. For comparison, we paid around $105 per night for a private poolside bungalow; and at Chaweng Regent paid $220 per night, a difference of $115 per night. We felt that the pool area at First Bungalow was larger, quieter, and more private. The beach at First Bungalow was also larger and much cleaner because it was at the end of the strip. Chaweng Regent had slightly better air conditioning in the rooms, a better jacuzzi/bathtub, a better location, and overall perhaps 'nicer' amenities- however, if Nick and I returned to Koh Samui we would certainly stay at First Bungalow again. If you are looking at Koh Samui resorts, I would recommend thinking about what a difference of $115 a night is, and how much you can purchase with that additional money. If you are unsure, just think about how most meals cost $2-4 and beers around $1. What type of traveler are you, and what matters most to you in a hotel room? Do you feel the extra amenities are usually worth it, or does it depend on where you are traveling to? This place looks amazing!! I've never been to Thailand, but I would really love to. What an amazing, beautiful place to go and relax on your honeymoon! I feel like the extra amenities are worth it but it does depend where I'm traveling to! Jessica- it was such a great stay! However, we felt the small change in amenities wasn't worth what we could have purchased in Thailand. When I saw the opening photo I immediately became jealous. I have not been on a vacation in years and this place looks amazing. I can imagine that it is the perfect place to just let down your hair and unwind. This is definitely somewhere where I need to go. Victoria, Chaweng Regent was such a great place for us to spent part of our honeymoon! We loved it. That sounds like such an amazing experience! My husband and I love to travel, and Thailand is definitely on our list of places we want to go. This resort looks downright beautiful and it sounds like you had such a great time there. And the price seems very reasonable for such great accommodations! Marysa, you should definitely travel to Thailand! It was such an amazing trip for us. Oh my word, that has to be heaven on earth. 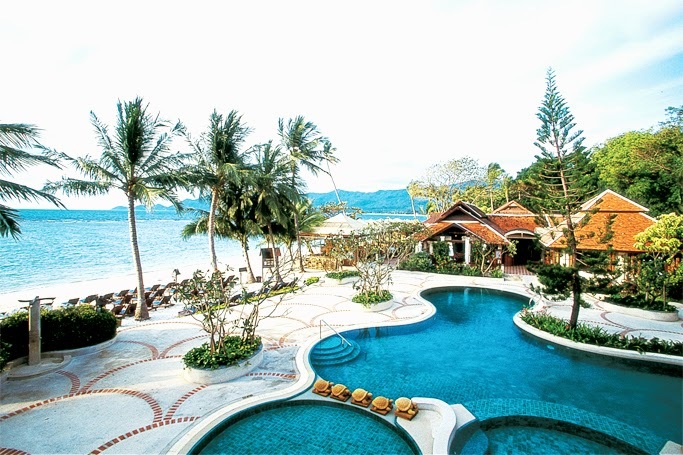 What a beautiful resort, I wish I could travel more so I could check out the Chaweng Regent Beach Resort. If my back ever heals to the point I can travel again, I'm heading to Thailand and other places on my places to see list. What matters most to me in a hotel/motel is the amenities. I want to be spoiled and pampered :). Terri, if you are able to travel again definitely check out Thailand! We absolutely loved it. Wow! Now that looks like a place to vacation (or honeymoon!) it looks beautiful. I never did get a honeymoon, but when we renew our vows at year 10 this is a certain possibility. I want to take a trip someone lovely, like this! That pool and beach in the background sure look amazing. Today especially since it's so far the coldest day of the year! I want to be there NOW! Jeanine, it was perfect for our honeymoon- and we would love to vacation there again! I think going for year 10 is a great idea- congratulations! I can't believe how affordable the resorts are! I have never been to Thailand, but I think it doesn't seem that out of reach after reading your article. It looks so beautiful! I will definitely be looking into this for my hubby and my 15 year anniversary. Thanks for sharing the beautiful pictures and information! Brianna, the resorts were so affordable- as was everything else! That is why we picked Thailand. Definitely look into it for your hubby and you- congrats on 15 years! That room is amazing!! Seriously, I'm super jealous and wish I could be there right now. I went to Thailand about 10 years ago and stayed in a really crappy hotel because it was cheap :) I think the cleanliness in a hotel room is the most important thing for me. It sounds like the First Bungalow was a great deal and I would definitely take that extra $115 a night for food and drinks! Jamie, that is exactly what we thought. Both places were very nice, but the extra $115 would have been a lot of money in Thailand- you know that from experience! Natalie, I hope you can make it to Thailand or SE Asia one day! We only got to experience thailand but loved it and can't wait to go back! Oh my!! This place is just so gorgeous!! I love the scenery, the vibe and that hotel room! I always wanted to go to a resort but I never have. I love the hearts on the bed and the orchid (my fave flower!). It looks like you have been having yourself an adventure of a lifetime! I would love to visit Thailand one day! Michelle, Thailand was so perfect for our honeymoon! The hearts on the bed was such a nice touch too for our first day. Thanks for stopping by Gingi! Looking forward to connecting. My time in Thailand was amazing- I definitely recommend it to you! My sweetie and I love traveling to places with water, and your first picture had me thinking that I need to find something like this (closer to home) for my sweetie. He'd just stay in that water all day long. I love the setting there, looks like the perfect vacation hideaway. One thing, you mentioned high heat in Thailand...that's a no-no for me. I do not function properly in hot temperatures. Oh wow...the pool are Chaweng Regent Beach Resort looks like so much fun. Yona- my husband was in the water so long he ended up getting an ear infection from water in his ear! If you don't like high heat, definitely don't do Thailand in April- but other times of the year it is much cooler! could you tell me what is best time for visit in Thailand. Hi! I think the best time to visit is really up to personal preference and where you are wanting to go. We visited Koh Samui in April, and it was certainly the hot season! Spring is the hot season for the Eastern side of Thailand, so a great time to visit!